When the 2015 flagship design was released, I was not all on board. Just didn't like the images. Of course, my tune changed when I held the card in my hand. I never tried hard to complete 2014, but I was going to complete the '15 release. I built series one from packs, jumbos, card shows and trades. 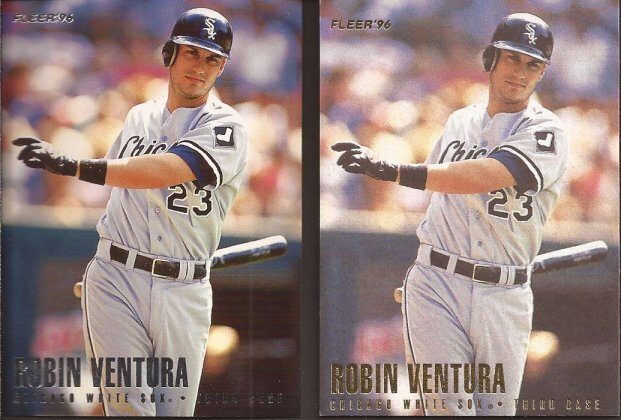 Series two, though, I jumped in with a jumbo box, though the collation was lacking. But I almost have it finished thanks to the kindness of you folks. You get three hits in a jumbo, and mine for the most part were boring: an autograph of Buck Farmer that went to Pat at Hot Corners. A Rangers relic of Josh Hamilton, which would have been a hell of a great pull 6 years ago, but now..... If anyone is interested in it, let me know. I also pulled a silver framed Sabathia card that I sent to Jereon at The Dutch Card Guy. Good pulls for other people, but nothing that really jumps out and grabs you. Hands above the waist, buddy. I had to steal that image from ebay - I forgot to scan mine. So I did pretty well. Always wanted to pull a coin card. Of course, I wanted it to be a team I collect, but one of the two hottest rookies in the NL this year is not chump change (see what I did there). But what to do with it? I thought about selling, but I figured it should stay in our group. But there are soooooooooo few Dodger collectors out there - how would I ever find one???? For the record, you Dodger collectors, I try and spread out the hits I get that show LA players. So I shot an email to Jim over at GCRL to see if he was interested. No brainer. Here's his return package. YUP! Packs of junk wax White Sox! Just kidding. Two packs of these started it off. I knew these existed, but never seen a pack, so it was nice to get two. 20 card team set, with 10 cards per pack. Theoretically, you can build a set with two packs, but I came up two cards short. Luckily, I had one of the two cards, so I am missing #11 - Dave Martinez. And a pack of these were ripped at the Pack A Day Circus, but Martinez is already claimed. Oh well. 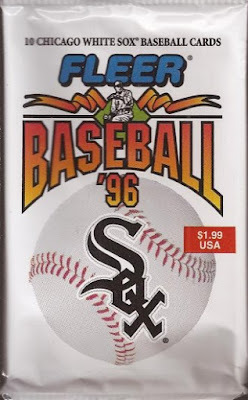 Lots of other random ChiSox in the package. I'm hungry right now, so a granola bar sounds pretty good. 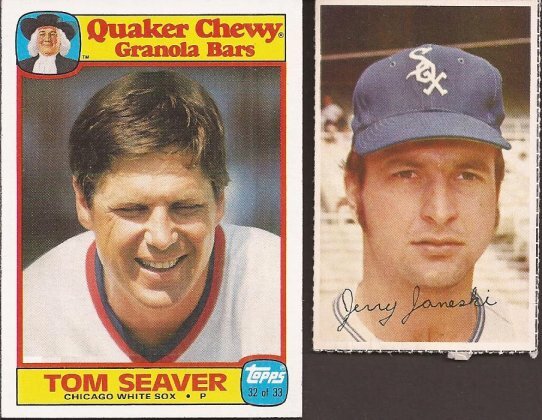 The Janeski is a stamp, I believe, white Jerry dressed up in the blue home unis with the scroll Sox logo they wore in '69 and '70. Bunting, throwback and miscuts were also in the package. So much to love in the Boudreau image. 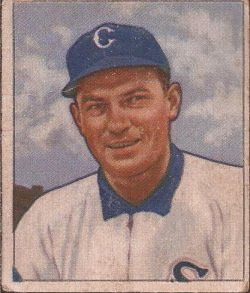 Highlight, though, is this sweet condition '50 Bowman of Bill Salkeld. I chopped the top off a bit in the scan. Only my 2nd '50 Bowman, as my first is in the Sox sampler binder, so it's nice to mark one off the team checklist. Thanks Jim. Enjoy that Pederson, Don't spend the money all in one spot! 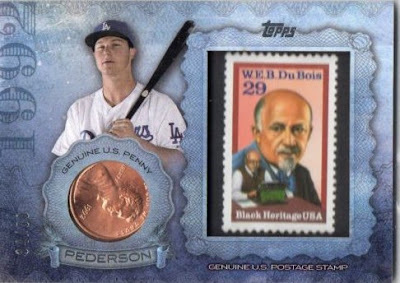 Man that Pederson card is/was money right there! (See what I did there ;)). Glad you were able to flip it for something you needed though. hey thanks. i'll go ahead and send the rest of the cards i have sitting aside for you and that pederson, though. Sweet early Bowman. Very nice! Thanks again for the Sabathia, awesome card ! Probably not many trades involving 50 Bowman and cards that have money built into them.